Samuel Beckett was certainly thinking of more cosmic things than bowls when he wrote that terse summary of life’s aims, but the words were so apt for the Nines team this week. There have been some close defeats this season, but none more so than the game with Ponteland on a sunny but surprisingly fresh evening. Even the Ponteland green seemed to have taken a chill, running much slower than in the sunshine two days earlier. Not that that explains the result, which was just one of those things. As Luis Suárez was getting his teeth into a new challenge against Italy, so we showed, er, a bit more bite against a side that was riding high in the league. The triples stayed close for a long time against a very strong Ponteland team, 9-9 after eleven ends before losing ten shots in the next five ends; even then they didn’t give up, scoring a six to make the last end more than academic, but it panned out as a five-shot win to Ponteland. Meanwhile David Ashworth’s fours went ahead early and the only question all through was how big the win would be – in the event they won by seven shots, Most important, they really looked like they were playing as a team. The West Tyne league is well into the second half already, but wins are still elusive, as shown by yet another draw ((59-59 on shots), this time against Prudhoe. David Ashworth’s team had a great comeback after being at least 11 shots down, and finished just four behind. One rink lost by 14, though, and this meant that Darren played his last bowls trying for a third shot to win the overall match. None of them went in, and two shots on this final end meant the match was drawn. It looks like Prudhoe and ourselves will be having a private duel for third place, and on this evidence it will be quite a tussle. This entry was posted in Bowls and tagged Ponteland, Prudhoe, Samuel Beckett, Suarez on June 26, 2014 by Fields. Last week’s tale of woe centred on the way the club had lost a couple of games after giving away big(gish) scores and not keeping it tight. So you’d think we might be able to do something about it, right? Wrong! The Nines match was at home to champions Backworth Welfare, never easy at the best of times and a particular challenge this year with a couple of first-pick players still out with health problems. Despite this, Darren’s triples were making a great game of it, leading 10-6 but then losing a six and a seven on consecutive ends to go 10-19 down with only two ends to play. It was the biggest collapse since Rory McIlroy’s implosion at the US Masters in 2011. Meanwhile, Trevor and Peter were making a decent fist of the game against Ian Brown and young star Josh Minto, recovering from 3-11 to win five ends on the trot and reach 10-11, when a single shot against was followed by a five. Suddenly the score was 10-17 with only four ends to go, and the asking rate was too much on a night when two shots was the maximum we were going to get on any end against really consistent opponents. A few weeks ago, at Wallsend Park, our pairs were slightly flattered by a 20-12 scoreline; this week, you have to say that it was the Backworth pair who were flattered by the same score, although in truth the pressure was quite relentless and – however hard it is to say – they deserved the win. 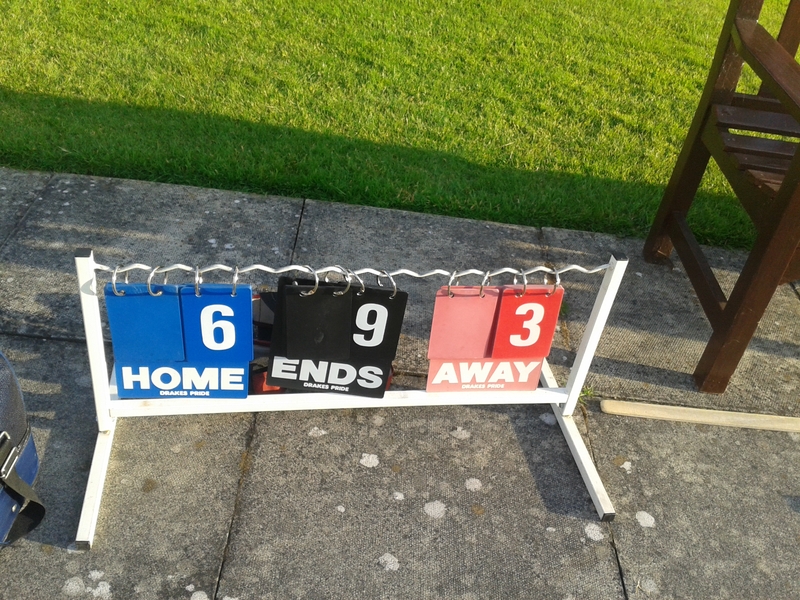 With the fours going down to an 8-21 defeat that was never in doubt, it was yet another 0-8 drubbing overall. After the first four matches of the season produced scores comparable to last year, the next batch has been nothing like. All we can do is rely on an improvement with a full-strength side in the second half of the year, and hope for favourable results from the other bottom clubs. The West Tyne League was no better, especially as we lost a couple of players on the eve of the match for non-bowling reasons. Brian Norman had kindly offered to stand in “if you’re desperate”, and we were, so he made his comeback a bit earlier than intended. The Haltwhistle match which opened the season was a real hammering, and this was not much better, with two rinks conceding over 20 shots while not making double figures. A special word has to go to Bill Nicholson, making his competitive début having barely joined the club – Darren’s rink went 12-4 ahead before suffering from vertigo and going down 13-16. Bob Turner’s rink had a handsome 25-16 win against a strong home team, so it wasn’t all gloom and doom even if the 1-6 points result put any chance of a title challenge in the same category as England’s World Cup hopes after their match against Uruguay on the same night. At least the ladies won this week, with a 10-2 victory over Ponteland on a glorious afternoon where several players were seeking the shade even during the match. (The men will need to remember that result when taking on Ponteland next week in the Nines.) Little news was forthcoming about the match, so we shall merely add that in a very enjoyable friendly we recorded our first win over Alnwick for several years, with four of five rinks winning and a 105-69 margin. Sadly, as in our big win against Consett last Sunday, friendlies don’t count for trophies or league status – but in view of the recent run of bad results we need to cheer anything we can! This entry was posted in Bowls and tagged defeats, Haltwhistle, Rory McIlroy, Uruguay on June 21, 2014 by Fields. The season so far has featured a number of games in which our teams have lost narrowly on shots, but found themselves on the wrong end of a big defeat because of the bonus points awarded either for the number of rinks won or for overall shots. This week was no exception – in fact, it produced some of the most frustrating results so far. The ladies were over at Tynemouth for their Collins & Shipley match, and ended up losing 42-45 on shots – a crucial gap when this league gives six of the possible 12 points to the winners on shots. Eileen’s rink came back well from 5-8 down to win six ends on the trot and win 16-9, but the other two rinks were running second for most of the game and ended up that way too. One of the messages that came out was the need to keep ends tight and to limit the damage on ends that are lost. The Tynemouth rink which won 18-16, for example, won only 8 of the 18 ends, but four of these counted 5,3,3,3 – that trio of threes coming in the last six ends. The overall result was a disappointing loss (2-10). Of course, it’s easy to analyse such scores but harder to do anything about it when the pressure is on. The men found the same thing in a narrow loss at High Heaton – narrow on shots, that is, but the 8-0 points margin to the hosts would make it sound anything but. Our pairs lost 16-19 for the second away game in a row – a particularly careless defeat as we were leading 13-4 after ten ends and by 14-7 after twelve. At that point a three and a four to the opposition brought the scores level, and the mood changed. The moral here was that there are ends where you might as well accept that you have lost a one, rather than try to “open things up” too early. The fours lost 12-13 after going into the last end level – Richard Marshall once again filled in admirably and Bob Turner almost brought the ship home. The triples meanwhile lost a seven en route to a four-shot defeat, so that the overall aggregate loss by eight shots hardly reflected the balance of play. We are not playing badly at the moment – but we are giving away too many counts. Having said that, our single point in the course of the Bell Cup (at Gosforth on 11 June) did rather reflect on the performance. The solitary draw from four matches meant we finished in fifth position of five on the day, and even allowing for the natural loss of motivation when it becomes apparent that there is nothing left to play for, this was a disappointing effort. At least Bernard won a raffle prize! There had been a much better showing in the Challenge Cup, held on our own green the previous weekend, when we finished second out of five, but well behind the excellent Cramlington team who duly qualified for the finals. 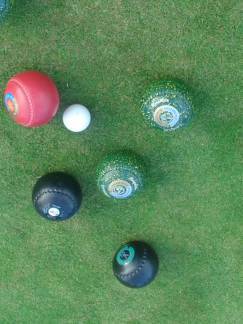 This entry was posted in Bowls and tagged Bell Cup, defeats, Haltwhistle on June 13, 2014 by Fields. Well, so much for confident predictions! Last week’s narrow loss in the Nines league seemed to be a minor setback when we knew it was followed by a home game against a team below us in the league, but clearly the boys from Heaton Victoria hadn’t read the script. Right from the off they were up and running, and although our Triples were strong enough on paper they were never ahead in the place where it mattered. There was a brief spell when a comeback seemed possible, with five needed with five ends to go, but then the game slipped away. It was a similar story for the Fours, with the disappointment all the greater because of a good recovery in the middle. At one point they were 6-14 down, and looking if not sunk then at least holed below the waterline. But a four and a couple more good ends brought them back to 14-16 with four ends to go, and just for a moment it looked like a win. Nothing came of it, however, and the final result was a loss by seven shots. The Pairs earned the only points of the night with a 22-12 win that possibly looked easier on the scorecard than it did on the green. There was some great bowling all night, and when the Heaton pair came back from 2-11 to 8-11, holding at least three shots, it was looking ominous. A couple of trails and take-outs helped enormously at that point, and there was a great sigh of relief when another trail took our score to an unbeatable lead of nine with one end to play. Or as positive as we can be. It was another night of frustration for Darren Cooper, as he and Trevor Field had to say “close but no cigar” against a pair of County players from Backworth in the Men’s Pairs. Although our pair played very well, the consistent standard of the opposition, and the way they played fine margins (“You’re looking for a thin edge on that bowl”, and so on) was the difference in the end. Let’s be honest, if you are playing three bowls to within a foot or so of the jack at club level you are expecting to be holding at least shot, not to be one or two down! In the photo here, our red bowl was lying shot, but all the others in the picture were against. The damage was done in a run of five losing ends which took the score from 5-2 to 5-10 in the first half of the match, and from there the gap was never less than three; in fact that was the final margin: 15-18. Trevor had a better result up at Amble earlier in the week, playing with Jean in the Mixed Pairs. They were always in charge, except for a brief comeback by the home pair in the course of a rain shower. This reduced the lead from ten shots to just three, but at this point the rain stopped and the Hexham team recovered to go back to ten in front. We had better start practising in the rain. This entry was posted in Bowls on June 8, 2014 by Fields.